The tape is used in therapy to relax overused muscles and in rehabilitation to facilitate underused muscles. 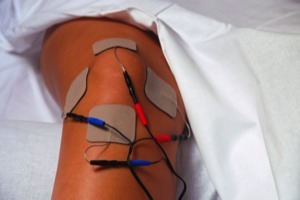 Electrical stimulation is commonly used for a wide variety of therapeutic effects including muscle strengthening, pain management, muscle re-education, and stimulation of denervated muscle. Massage is a manual (done by hand) therapeutic technique that produces different effects mechanic and reflexive excitement or relaxation of muscles. Ultrasound is a common deep heating agent that transfers heat through conversion and elevates temperature of your tissues up to 5 centimeters deep. The modality uses high frequency (noise) vibrations to produce heating and non-heating effects. Thermal effects include: accelerating the metabolic rate, modulation of pain, reduction of muscle spasm, decreased joint stiffness, increasing the speed of nerve transmission, increased circulation, and increase stretch-ability of tissues. Non-Thermal effects include: Increase cell and skin permeability (more in and out flow to cells), increase intracellular calcium levels, facilitation of tissue repair, and promotion of normal cell function. Graston Technique is a form of instrument-assisted soft tissue mobilization that enables therapists to detect scar tissue and restrictions that may be causing the patient pain or limiting their function. The technique uses specially designed stainless steel instruments, along with appropriate therapeutic exercises to effectively treat soft tissue injuries or chronic inflammation. If you are interested in seeing if Graston Therapy can help you, please feel free to contact any of our clinics.